1. 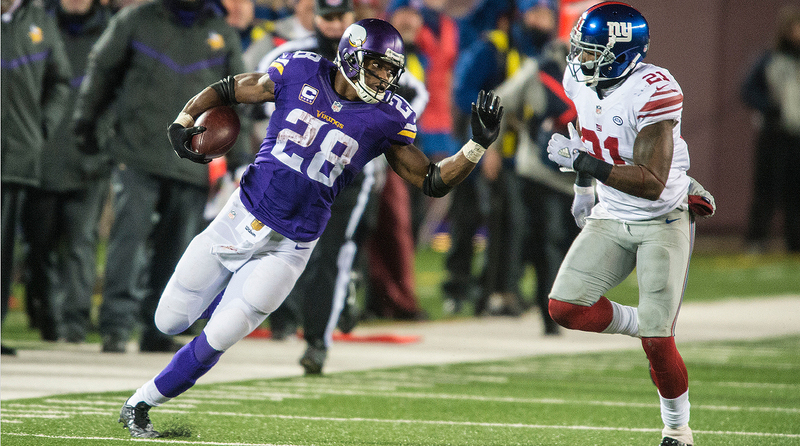 Adrian Peterson and the New York Giants are potentially a match made in heaven. Peterson’s running style is a perfect fit for New York. Or, more accurately, New York’s ground-game approach is a perfect fit for Peterson. The soon-to-be-32-year-old is not nearly as proficient on designed outside runs or behind man-blocking concepts. (He’s too impatient.) But when he’s healthy, there isn’t a more explosive force on inside runs. Few running games are as straightforward as the Giants’. They keep everything between the tackles and emphasize double-team blocks at the point of attack. This is the approach Peterson operated behind in Minnesota. Except the Vikings didn’t have a wide receiver to which defenses must dedicate safety help. Imagine having to account for both Peterson and Odell Beckham. And imagine those two playing with Eli Manning, a veteran quarterback who can read the safety pre-snap and check into the optimal play. There are just two complications with Peterson and the Giants. One: Although it’s an inside run game, a lot of it occurs out of shotgun. That would have to be amended for Peterson, who is better when the quarterback is under center. (Markedly better, in fact. His career yards per carry when the QB is under center is 4.9. In shotgun, it’s 3.7.) Two is New York’s meager $12.8 million cap space (fourth-lowest in the league). But Peterson probably won’t command north of $10 million, and adjusting other players’ contracts can create the needed room. The Giants might be a perfect fit for Adrian Peterson as he hits the open market. 2. It feels like the wide receiver market is about to boil over. A few weeks ago there were reports that Miami’s Kenny Stills could command as much as $12 million a year. If that’s true, there are three guys who should get $15 million-plus: Alshon Jeffery, Terrelle Pryor and DeSean Jackson. Jeffery is the most tantalizing and Pryor has the most upside, but it might be the 30-year-old Jackson who could change an offense most dramatically. Jackson still has top-level speed, evidenced by his league-leading 17.95 yards a catch last year. 4. It’s not a good year to need interior offensive line help. The draft class is considered average here, and free agency offers no sure things. Longtime Jet Nick Mangold is aging. Green Bay’s T.J. Lang and JC Tretter have been mostly superb, but are coming off injuries. Ronald Leary, a soon to be ex-Cowboy, is a mediocre athlete who, at his next stop, won’t be playing between young Pro Bowlers Tyron Smith and Travis Frederick. Kevin Zeitler might be a safe bet, but Cincinnati’s interior O-line issues last season give you pause. The better bet, given that he’ll be much cheaper than Zeitler, could be Detroit’s Larry Warford, who shows no glaring strengths or weaknesses on film. 5. If there was ever any question about how valuable edge rushers are, look at the franchise tags slapped on Chandler Jones, Melvin Ingram and Jason Pierre-Paul. These were the only three dynamic pass-rushers in their prime who were potentially available. Fascinatingly, there are three likely future Hall of Famers past their primes who remain available: DeMarcus Ware, Dwight Freeney and Julius Peppers. All still stand out on film, just in reduced roles. 6. Never has one free-agent class presented such a large cast of run-stopping defensive linemen. That’s bad news for those players—a number of whom may have to settle for one-year prove-it deals, like cornerback Prince Amukamara did for $5.5 million with the Jaguars in 2016. There’s a variety to choose from. At the top: freakishly athletic 300-pounders Dontari Poe, Brandon Williams, Bennie Logan and Calais Campbell. Right below them are lesser known but impactful forces who are built to play two gaps but can consistently shoot into one, guys like New York’s Johnathan Hankins, Washington’s Chris Baker, Denver’s Sylvester Williams and New Orleans’s Nick Fairley. (Of the bunch, Fairley might be the best value. He had to settle for a one-year deal with the Rams in 2015 and a one-year deal with the Saints in 2016. He was tremendous for both teams, showing the relentless motor that other clubs weren’t sure he had.) Lastly, there are unheralded veterans. Think Alan Branch, who was dominant for New England down the stretch. Or Lawrence Guy, whose ability to consistently punish tight ends allowed Baltimore’s more recognizable forces to shine. Overall, it’s as compelling a class of run-defending D-linemen as you’ll find in any year. 7. The most surprising available free agent is Dont’a Hightower. Maybe we shouldn’t ever be surprised by the Patriots’ willingness to part with expensive stars. But Hightower is extra critical in their scheme, which features a litany of fronts. He is stout when aligned on the line of scrimmage, and he’s an excellent downhill defender from a stacked ’backer position. Perhaps the Patriots believe Hightower’s market will stay low because he’s only so-so in coverage. But it’s hard to envision that happening. Starters from Super Bowl-winning teams always get overpaid, especially those who made as many flashy plays down the stretch as this one. 9. The man who will get this year’s Holy crap! deal is Cardinals safety Tony Jefferson. His steady, sharp improvements in man coverage, plus his knack for blitzing, make him a five-tool safety. That can change the entire makeup of your D. Jefferson is available because the Cardinals chose to pay his teammate, Tyrann Mathieu. The Honey Badger got $21.25 million fully guaranteed, and a total $40 million in guarantees if he can stay healthy in 2017. Don’t be surprised if Jefferson (nickname still to be determined) gets near that. 10. The thing we all must remember: Almost every free agent becomes a free agent by being either flawed or overpriced. That’s why his previous team let him get away. This doesn’t mean the stars can’t be stars. It just means buyer beware.